Boxy steamer trunks have upsides the interior design world is just waking up to. They can keep most unruly stuff unharmed and unwrinkled over many a nautical mile, plus, they do double duty as benches, desks, wardrobes and more. Here is Louis Postel's pick of the best. One day in the early 1970s, Marley Hodgson came across a collection of boots, belts and backpacks belonging to a British Ghurka commander at an estate sale. Despite the Ghurka soldiers’ reputation for toughness, this centuries-old leather gear felt surprisingly soft, even after all that time. Shortly thereafter, Hodgson designed the first of his famous Ghurka collections in Connecticut. 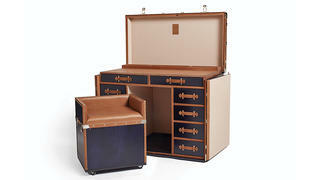 This trunk/desk, made in collaboration with noted Italian luggage maker Bertoni, comes in French bull leather with studded trim, cotton twill lining, hand-painted stripes and brass palladium hardware finishes. When 16-year-old Louis Vuitton arrived in Paris, he arrived on foot, a poor apprentice. At that time, the more privileged got around in horse-drawn carriages, boats and trains, but this didn’t stop their luggage from getting battered mercilessly. Such abuse drove many a customer to Vuitton’s master, Monsieur Maréchal, for help packing, crating and protecting their belongings. Seventeen years later, Vuitton opened his workshop near Place Vendôme. 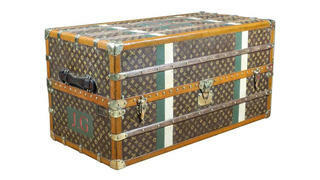 This steamer trunk from the 1930s features the iconic LV stencilled monogram on canvas, leather-top handles, brass locks and an interior with folding hangers, a shoe section and two removable suitcases. Keen on the metal muscularity exposed in converted lofts? 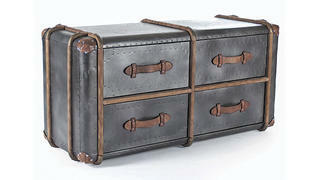 Consider adding a classic Victorian trunk in industrial-chic grey iron to your luggage collection. Studded leather corners and wood rims define the nail-trimmed body of the four-drawer “Coberg” model from Kathy Kuo Home. In landlocked Nebraska, Charlie Zeller excels in the fancy bending of wood that pirate chests with domed tops require. While such chests will keep the rain off the booty, they won’t stack. 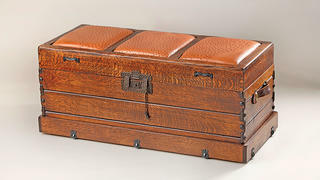 Zeller’s relatively flat version, an ostrich-top padded trunk, doubles as a bench, perfect for changing into the flip-flops one can readily stash below. 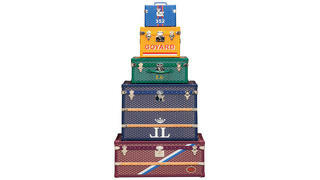 Rockefellers, Romanovs and Grimaldis may have charted different courses, but they all did so with Maison Goyard trunks in tow. Piled up, they appear to celebrate the very dawn of the machine age — in the form of, say, steamships — and at the same time old-world craftsmanship, the combination of eye, hand and mind working with leather, metal and Goyardine canvas.